Reflexology is a holistic treatment that involves applying pressure to points on the feet or hands using fingers. It is based on the principals that these points reflect different parts of the body. Reflexology may also be referred to as Zone Therapy. 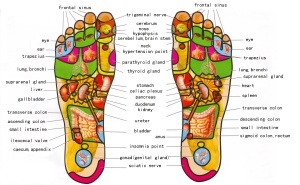 The exact roots of Reflexology are difficult to trace. There is evidence of reflexology type techniques being used in China and India over 5000 years ago, Ancient Egypt and Greece. Modern techniques were first established by Dr William Fitzgerald who first proposed the theory of the body being divided into 10 zones that could be stimulated in areas of the feet. His student Eunice Ingham continued this work developing foot charts that are similar to those used today. Reflexology is a gentle, non-invasive holistic treatment working on the mind, body and spirit. 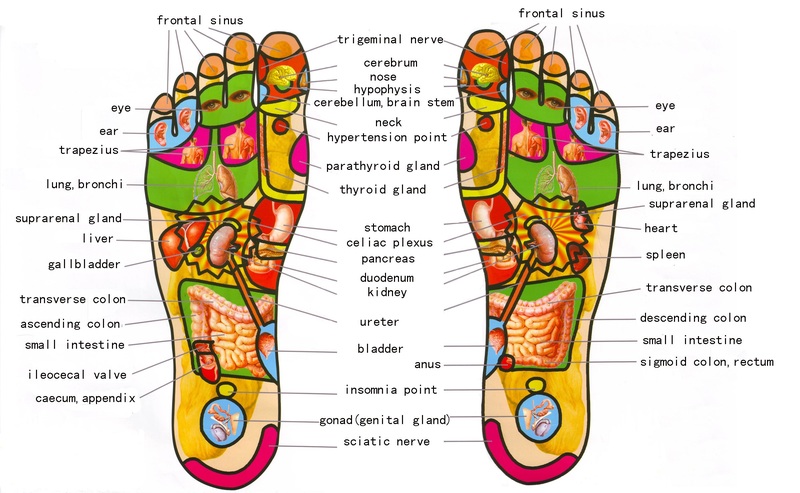 Areas of the body are connected by energy channels and pathways which are reflected in the ten reflex zones of the feet. If there is an imbalance in one part of the zone then the entire zone will be affected. It works by combining massage and pressure point techniques to the feet or hands. By applying pressure to these points that represent glands and organs the body can be affected inside and out. The pressure applied to areas of the feet may evoke changes in specific organs and the relationships between organs in body systems, encouraging energy to flow more freely and revitalising the area to restore balance. Areas of imbalance or congestion can manifest themselves as areas of tenderness, tightness, lumps, hard areas or areas of small grains or crystals. These crystals can be build ups of calcium collecting at the nerve endings or uric acid building up at peripheral capillaries. They are the resulting waste of poor cellular metabolism, sluggish vascular or lymphatic return. As these areas are massaged tingling or shooting pains may travel round the body, the corresponding area to that being worked may experience sensitivity. Promotes relaxation reducing stress and tension in the muscles and freeing constricted nerves. Blood and circulation are stimulated to bring nutrients and oxygen and the elimination of waste is improved. The basic foot map shows the spine reflected as the inner edge of the soul of the feet, the toes represent the head and specific glands or areas, the torso is signified as the main body of the foot, the chest, lungs and thymus are indicated in the balls of the feet and the abdominal cavity is covered by the arch of the foot and the pelvic cavity is signified in the heel. The foot bears whole body weight. This distribution can be affected by body posture. Poor posture can cause pressure on different areas of the feet. Fallen arches can manifest themselves as chest pain or flat feel might present as back pain. Conditions such as dry or cracked skin may indicate poor hydration, poor circulation or dietary deficiencies. Corns and calluses can be present in areas of imbalance areas or sensitivity. Urinary or digestive dysfunction can manifest as flaking skin and fungal infections. Kidney stress and bladder issues may present as excessively sweaty feel and areas of puffiness and swelling. Changes in skin colour can also indicate dysfunction in the body a yellowing if the skin for example might indicate live and kidney troubles, a diet high in salt might present as excessively pink in colour and a blueish tinge might be present in cases of poor circulation. Reflexology is beneficial for a wide variety of complaints such as digestive problems, menstrual irregularities, headaches, fatigue, aches and pains and inflammation. Massage and pressure point therapies help increase blow flow improving circulation and boost the immune system by improving lymphatic flow. It is known to be deeply relaxing. Reflexology has been shown to help the body release endorphins which help improve mood and encourage feelings of wellbeing.